Thinking about taking a nice cruise over the holiday period? If you decide on it you’ll be one of about 20 million people who hop on the giant floating hotels every year. And while it’s surely an incredibly relaxing way of spending some cash and searing in a sunglass tan before heading back to the office, it turns out cruise liners are even worse for the environment than you thought. Here are some sobering facts from the Friends of the Earth, who graded 16 cruise liners on four environmental factors. Each year cruise ships dump 3,78 billion litres of sewage into the ocean. That number is difficult to get your head around, so think of it this way… A single 3000-person cruise liner generates 568,000 litres of sewage per week, which is enough to fill 10 backyard swimming pools. To reiterate, that’s one cruise ship every week. As you’d expect, lots of sea creatures (particularly manatees off the Florida coast) are dying very stinky and unpleasant deaths that’s to this vast and crappy gift. And according to the US EPA, each day an average cruise ship is at sea it emits more sulfur dioxide than 13 million cars and more soot than 1 million cars. 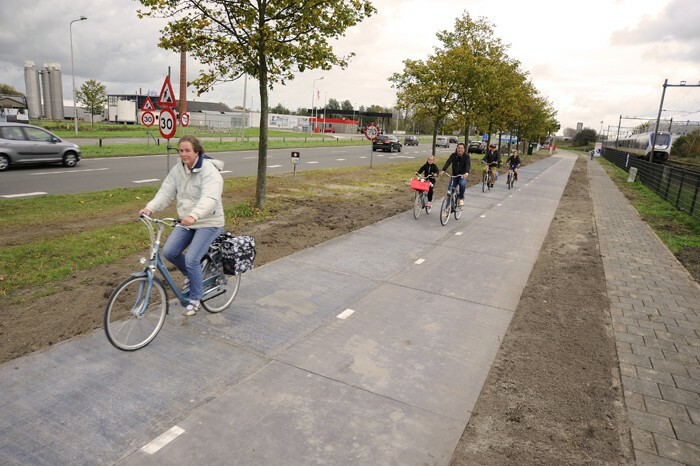 The world’s first solar bike lane is soon to be available for use in the Netherlands! The bike path that connects the Amsterdam suburbs of Krommenie and Wormerveer is a 70-meter stretch of solar-powered roadway set to open for the public on November 12th, 2014. The new solar road, which costs €3m (AUD$ 4,3m), was created as the first step in a project that the local government hopes will see the path being extended to 100 meters by 2016. 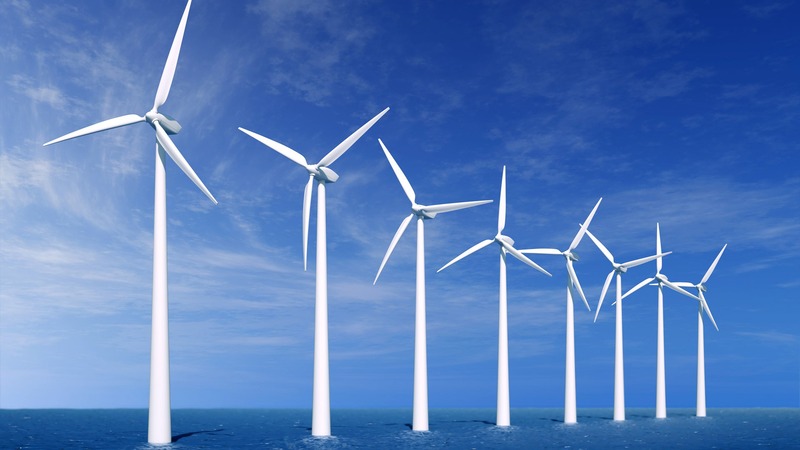 More complimentary plans are also on the table as the country intends to power everything from traffic lights to electric cars using solar panels. School children and commuters see the bike road as very useful and a cool part of their daily commute, with approximately 2,000 cyclists expected to use it on an average day. 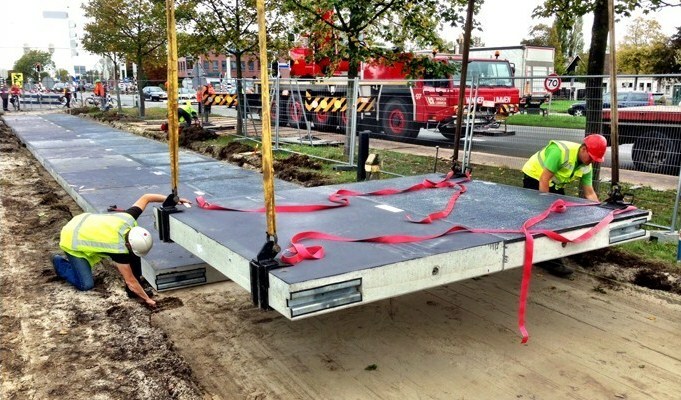 The road, which is named by the Netherlands Organization for Applied Scientific Research (TNO) as SolaRoad, is set to open in the next week. It is made up of rows of crystalline silicon solar cells, which were embedded into the concrete of the path and covered with a translucent layer of tempered glass. 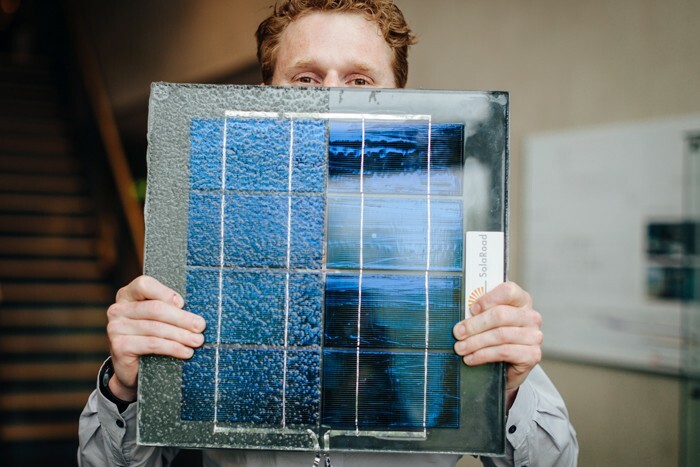 Since the path cannot be adjusted to the position of the sun, the panels will generate approximately 30% less energy than those placed on roofs. However, the road is tilted slightly to aid water run-off and achieve a better angle to the sun and its creators expect to generate more energy as the path is extended to 100 meters in 2016. Actually, SolaRoad is not the first project aimed at turning roads and pathways into energy-harvesting surfaces. Solar Roadways are another major project -you can find out more about them by clicking HERE. The following video was posted online less than year ago, getting over $2.2 million to start the production. But the difference between the two projects is that Solar Roadways are working to integrate programmable LEDs in order to achieve custom road signs, heating components to drive away ice and snow, and specific kind of corridors to store fiber optic and TV cables. 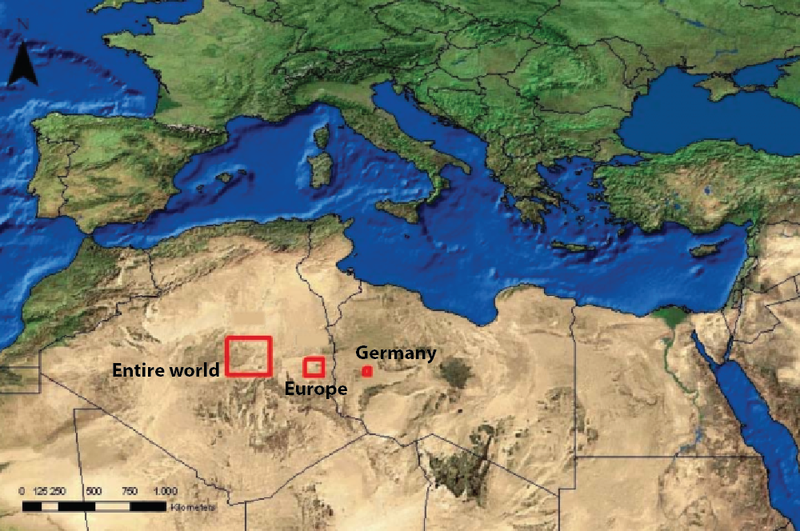 The image above has three red boxes showing what area would need to be covered for Germany, Europe and the entire world. The Scandinavian nation of more than 9,5 million citizens has run out of garbage; while this is a positive – almost enviable – predicament for a country to be facing, Sweden now has to search for rubbish outside of its borders to generate its waste-to-energy incineration program. It’s namely Norway officials who are now shipping in 80000 tons of refuse annually to fuel the country with outside waste.